As I have loved you? The text from St John 13:34 which stands at the masthead of this blog, and has done so since I created it, is the hardest one for Christians to keep. We can keep to the commandments (with difficulty), we can keep to the Law and what it says (with difficulty), we can repent (and sin again, and repent again), and we can, with the help of God do all manner of wonderful things through faith. But by far the most difficult is to love one another as he loved us. I have just noted, with huge sadness, that Grandpa Zeke, whose comments are always loving and caring, has decided that the tone of the comments here about Michael Voris mean he can no longer be with us. Perhaps, as is sometimes the case, those whose tone he has found so unhelpful will wonder at his sensitivity – if so, then perhaps they cannot love as Christ loved us? Those who so often need to preface the word love with the word ‘tough’, may also be a way off loving others as he loved us. If so, they can join the club – because this is, as I say, by far and away the hardest things for us to do. Let us consider. Christ loved us and we, that is mankind, crucified him. Christ loved his disciples, and many of them left him when they could not take his ‘hard saying’ about eating his body and drinking his blood; the rest of them ran off at Gethsemane – except for the one who had already accepted money to betray him. Even when he rose, some of them were slow to believe. He loved them throughout, and he prayed for forgiveness for those who crucified him, and he promised the repentant thief that he would be in paradise with him that same day. It is no accident that in old age, when St John was asked for advice, he would say ‘little children, love one another’ – just as it is equally unsurprising that the Fathers who tell us this tell us that those who heard it went away disappointed. They wanted, perhaps, some great insight, some profound truth which would renew their lives. Or perhaps they wanted some strict rule that would aid them in their Christian lives, something by which they could govern those impulses which come to all of us and which we call the temptation to sin. If so, their disappointment is understandable. Here was the last of the Apostles, one who had leant on Christ’s breast at the Last Supper, and all he could tell them was to ‘love one another’. Christ says it is by that love for one another we shall be known as his. This is the acid test of Christianity. If that is the supreme piece of evidence and we were on trial for being a Christian, how many of us would actually be convicted? To love those who betray us, who desert us, who do bad things to us, as well as those whom it is easy to love – can we do that? For me that’s a particularly live question as, for reasons I’m not going into. I have had a lot of disruption in my life and have been betrayed by quite a number of people whom I trusted, for whom I have worked hard, and from whom I had every reason to expect kindness and help and yet who, when it came to it, offered none of these things. I know one of them has repented and said he is sorry to me, and I had no trouble forgiving him; but can I love him as I am commanded? Yes, I think I am getting there, but it isn’t easy – but then is it meant to be? What about the others? They have not said sorry to me, indeed they have ignored me, even if one of them has, thanks to the efforts of the lawyers, settled out of court for unfair dismissal. Do I forgive him? Yes, I have done so in my heart; can I love him – I don’t know. I have no bitterness or bad feelings, but as yet, love is hard; but I pray and I am getting there. So, when I say it is the hardest thing, perhaps I am alone in finding it so? Jesus loved us though we were sinners, and he died for us sinners. Some of us might screw up the courage to die to save someone else were we unfortunate enough to be in that position (though I pray never to be tested), but could we die for ‘a sinner’? Jesus did that. He did it for me and he did it for you. I can, and do love him for that, and I love my fellow Christians – but those who have hurt me deeply and who have not said anything like ‘sorry’ – I’m working on it. Forgiveness, which I have I think reached, is not enough if I am to obey Christ – I have to love them. But then I think, I am a sinner being redeemed, so as part of that, can I not find it in my heart to do more than forgive? Can I? I pray for that. It’s a work in progress, so, before anyone thinks I am preaching at them, I’m not, I’m writing a memo to myself. 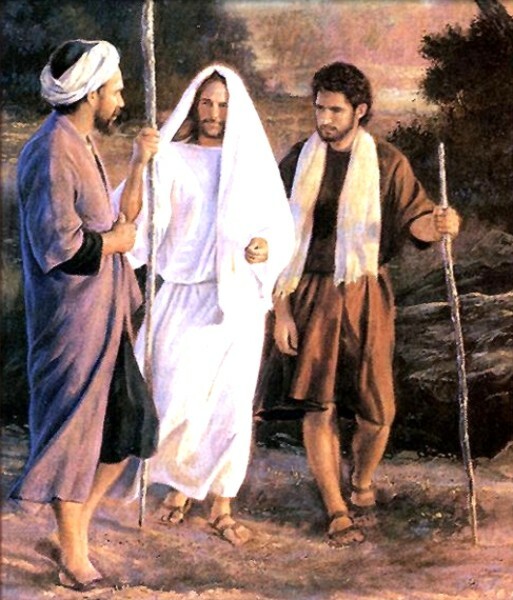 “They were going to a village named Emmaus, Jesus approached and began traveling with them; beginning with Moses and with all the prophets, He explained to them the things concerning Himself in all the Scriptures Lk. 24:13-27. Jesus testified about all the OT scriptures concerning Himself John 5:39, Luke 24:13-27 teaching His disciples. He is the source of their teaching about Himself, what they learned about is what they taught them. With the Old Testament and the life of Jesus Paul and the others were equipped to write the New Testament revelation through the Holy Spirit. This passage alone indicates that the resurrected Lord must have been with these two disciples for quite some time. It is remarkable for its brevity which encompasses ‘Five Names of God’ and reveals the relationship between these well-known Old Testament Names and the New Testament Name of Jesus who is both God and Man, our Lord Jesus Christ is clearly shown in this passage. The Names of God are first listed 1) to 5) in order of frequency as they appear in the passage. 1) יְהוָה (YHVH) ‘The Tetragrammaton’. The Old Testament personal Name of God occurring in 5,321 places. It is considered un-utterable in the synagogue where it is usually substituted with the Name Adonai (Lord) This Tetragrammaton is translated LORD in most translations and Jehovah in other translations. This Name is frequently pronounced incorrectly as “Jah-weigh”. The actual pronunciation is unknown. 2) אֵל (EL) God, god, mighty one. The Old Testament use of the word either denotes the ordinary name “god” or “the God” of Israel. 3) יְשׁוּעָה (Yeshua) is the Hebrew name for Jesus. “And she shall bring forth a son, and thou shalt call his name JESUS: (Yeshua) for he shall save his people from their sins” Matthew 1:21. “To him give all the prophets witness, that through His Name everyone who believes in him receives forgiveness of sins” Acts 10:43. The Tetragrammaton is not a Name that may be called upon for salvation, as it cannot be pronounced. Jesus, the Name which all men may believe upon for salvation, is easily uttered. What better Name for Him, ‘The Lamb of God’ who takes away the sin of the world than ‘Salvation’? Jah occurs 50 times in the Old Testament. It is sometimes rendered “LORD” in the KJV. ‘Kidosh Yisra’el’ – ‘The Holy One of Israel’ occurs 37 times in the Old Testament. Isaiah 12:1-6 (JND) is modified below by modernising personal pronouns and various terms and substituting the English names of God for the Hebrew Names and inserting transliterated forms in parentheses to indicate the Son of God, His incarnation, crucifixion and atonement, second coming and also the believer’s salvation through Him. Isaiah 12:1 “And in that day you shall say, יְהוָה (YHVH / Yahweh), I will praise You; for though You were angry with me, Your anger is turned away, and You have comforted me.” – Here sin is atoned for and forgiveness through the Lord Jesus Christ is available. Rom.3:25, 1 Jn.4:10. For only in Christ can a man’s sin be forgiven and only in Christ may mankind find and know the comfort of God. 2Cor.1:3-4. Isaiah 12:2 “Behold, אֵל (EL) is my יְשׁוּעָה (Yeshua): I will trust, and not be afraid; for יְה (Jah) יְהוָה (YHVH / Yahweh), is my strength and song, and He is become my יְשׁוּעָה (Yeshua).” – Here we see we see the God of Israel is one and the same as Yeshua and that His very Name means Salvation. We see the incarnation of Christ and His crucifixion, as He becomes the salvation of sinners. We read that for the believer trust displaces fear 2Tim.1:7, Rev.1:17 as the sinner owns Jesus Christ as Lord and Saviour. So with sins forgiven and knowing God as his strength and his song he goes rejoicing. In this we see the change and empowerment the Holy Spirit brings as the believer is baptized with reference to and for the Body of Christ 1Cor.12:13. Isaiah 12:3 “With joy shall ye draw water out of the wells of יְשׁוּעָה (Yeshua).” – Here we see the believer’s dependence on Christ for his very sustenance and the Christian’s joy as he draws from the Holy Spirit, who is seen in the water Jn.4:1, and who leads the believer in service of Christ His Lord Act.6:8. 2) He calls upon the Lord with prayers and supplications; Php.4:6.
and calling them to faith in our Lord Jesus Christ 1Cor.15:1; Php.1:14; Titus 2:1. Isaiah 12:5 “Sing psalms of יְהוָה (YHVH / Yahweh), for He has done excellent things: this is known in all the earth.” – The believer worships ‘The Most High’ in words of highest praise. Here Jesus is returned to earth. In Rev.14:1 the faithful, those in the first resurrection Phil. 3:10-11 are with Him and behold His greatness. They sing together ‘The Song of Moses and the Lamb’ Rev. 15:3-6; Deut. 32:1-43 and participate in His Millennial reign Rev. 20:6; Matt. 24:45-47; Rom. 8:7&18; 1 Cor. 4:7-10; 2 Cor. 4:17; 2 Tim. 2:11-12; Heb. 11:25; Rev. 2:26; 3:21; 7:14. Tags: Salvation, Forgiveness / Atonement, Jesus Christ, Trinity, Suffering & Rewards.